sink rates than have ever been achieved in the 18m class. The two level water ballast system with separate wing and trim tanks allows for wing loadings up to 54.7 kg/m2 (11.2 lb/ft2 ), currently the highest value found in the 18m class. Even fully loaded does the Antares 18S/T climb well in narrow and turbulent thermal bubbles. 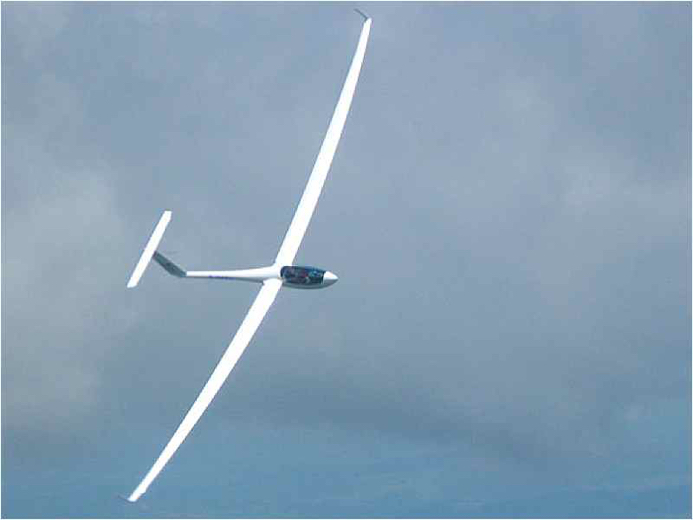 A defining characteristic of the aerodynamic design of the Antares is that the best glide ratio is achieved at high speed. The Antares 18S/T achieves its best glide ratio (53:1) at 100 km/h (54 knots) when flying with low wing loading, and at 135 km/h (73 knots) with high wing loading. Nine different airfoil sections, finely tuned to one another, provide minimum pressure drag and friction drag. The boundary layer remains laminar up to 95% of the wing chord on the lower surface of the wing, at which point a turbulent boundary layer is triggered using turbulator tape in order to avoid the forming of a laminar separation bubble. On the upper surface, the boundary layer remains laminar up to 75% of the wing chord. This is the highest value currently available for a sailplane. The usual aerodynamic losses at the wing-fuselage interface are minimized by a careful design of the mid-fuselage section, and by the use of specifically designed wing airfoils close to the fuselage. which yield high manoeuvrability. The movements of the flaperons are controlled using a novel control mechanism (patent pending). As a result full waterballast does not affect the control forces. Furthermore, a consequent utilization of high performance low friction ball bearings instead of plain bearings substantially reduce friction in the control mechanisms, resulting in an aircraft which is extremely light on the controls. A characteristic feature of the stabilizer is that it combines a relative large surfaces with a high aspect ratio and modern airfoil sections. Stabilizer drag is kept at a minimum by ensuring that the stabilizer only needs to produce very little lift when in steady flight. The polar speaks for itself. See the next page.